Greetings, The overwhelming response for our previous book 'SMART ENVIRONMENT' 2013 motivated us to dedicate this book 'SMART ENVIRONMENT 2014' to the IAS ASPIRANT COMMUNITY who are the pillars of our institute. The trend of more number of Environment questions (around 15-20) in Civil Services Preliminary exam is likely to continue in 2014 as well. Last year, aspirants found our 'SMART ENVIRONMENT' book extremely useful to tackle questions in the preliminary exam 2013. 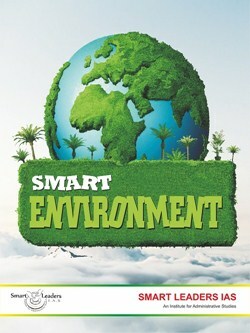 We hope that this year too the legacy of 'SMART ENVIRONMENT' would continue. We Congratudate our smart content team composing of Mr.S.SureshKumar,Mr.P.Karthikeyan, Mr.Sumeet M. Bafna and Ms.Ramya for their valuable contribution to this book. HAPPY AND FRUITFUL READING. ALL THE VERY BEST FOR YOUREXAMS.